I've lost count of the number of reviews I've seen of this shampoo in various places around the internet! Other than this product and their mascara, I've not actually tried anything else from Essential Care. The brand is UK based and family run, offering a range of over 60 products that are made with natural ingredients and are free from synthetic chemicals. For a good few years on and off I've had the ever-so-flattering issue with a dry flaky scalp, so understandably I like to mostly use products on my hair that are free from the synthetic chemicals that are likely to irritate my skin. 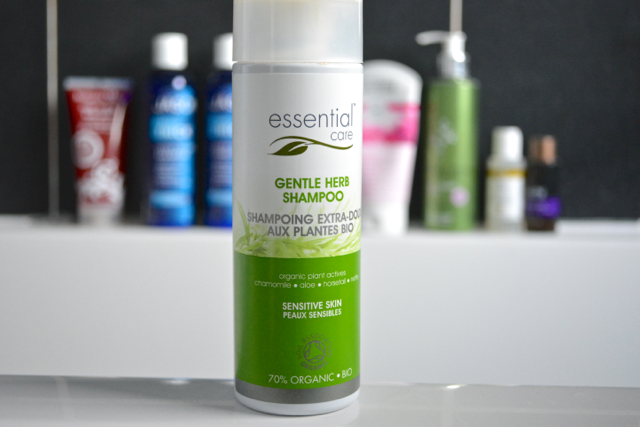 When searching for a new shampoo to try a couple of months ago, the Essential Care (recently re-branded to Odylique) Gentle Herb Shampoo (200ml RRP £10.50) kept popping up so I decided to give it a try when I had a discount code to use online at the time. Now that I'm coming to the end of the bottle I thought it was about time to share my thoughts on how this shampoo has performed! With 100% natural ingredients (70% being organic) you can rest assured there's nothing at all hidden in there that will irritate your skin. It's also free from sulphates, so if you're used to your shampoo producing copious amounts of bubbles this one may be a surprise to you as it will only produce a very small amount of lather. I have quite thick hair so I do find it takes me a good 5 minutes to properly massage into my scalp and, as with most natural shampoos, I also tend to find it necessary to do a double wash to get my hair properly clean. This shampoo is kind of a 2-in-1 product in the way it is formulated, so you technically don't need to use a separate conditioner. This may be the case with shorter hair, but personally my long hair does need a separate conditioner to help keep the ends from drying out. Overall I have noticed an improvement in my scalp since using this shampoo, so I would definitely say it's claim of helping to relieve itchy/flaking scalps is true! If you have a sensitive scalp and are looking for something that might help, I would highly recommend giving this shampoo a try! Have you tried this shampoo before? What other Essential Care products would you recommend? What an amazing review - thank you so much!! !